It was only 32 years ago, in 1985, that women were allowed to compete for the first time at the Rio de Janeiro federation thanks to Yvone Duarte, the first ever female black belt. 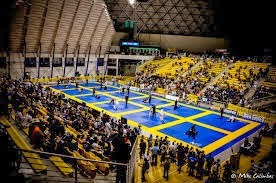 Later in 1998, women’s divisions were added to tournaments at the International Brazilian Jiu Jitsu Federation, or IBJJF. At the time there were only two female weight divisions, which combined all belt levels. And there were reportedly not enough female competitors to fill out a weight division, at first. But gradually, with the increase of female competitors, more weight and belt divisions were added. From 1998 to 2015 the IBJJF has seen female competitors increase by 5-10 percent per year. Today women blue- and white-belt competitors make up the largest divisions. According to IBJJF adding two new weight classes — rooster and super heavy weight — in 2015 likely also contributed to the growth of female competitors. Other reasons for the boost in female competitors were changes to training environments and rules that emphasized safety. Organizations like F2W Pro have also been doing their part to support women in jiu jitsu as well. F2W Pro is currently the only organization offering women the opportunity to headline a jiu jitsu event. Five females headlined matches in a total of 31 events held. Seth Daniels, F2W Pro owner, says events featuring women headliners have at times brought in sales equal to that of the men. Female-only tournaments like Copa Bela have also contributed to the increase of female competitors. Copa Bela, which was founded in 2012 by Gustavo Dantas of GD Jiu-Jitsu Events, initially drew 36 participants. Since then participation has almost tripled! Last year in 2016, there were 90 participants registered. Organizers say they anticipate even more this year. 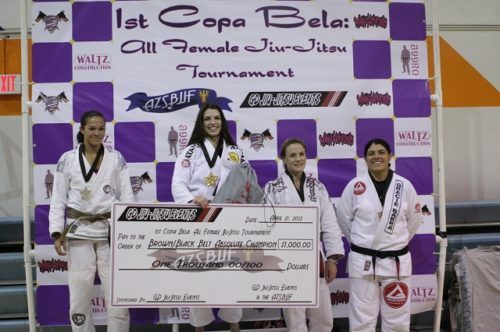 Copa Bela offers juveniles, adult and masters divisions for females. Black-belt Sarah Black, a competitor and long-time supporter of Copa Bela, says having a smaller number of competitors in women-only tournaments means they can really focus and bring attention to the skills of women in jiu jitsu. It also allows for a less intimidating environment for the rookie competitors. Female-only tournaments like Copa Bela tend to have a lot of first-time competitors and serve as a gateway to participation in co-ed tournaments. And it is not uncommon for moms to and daughters to compete beside each other at Copa Bela. For many local female competitors Copa Bela may be their first tournament, but it is likely not their last. The next Copa Bela kicks off on April 29 at the Phoenix College (North Gym) at 1202 W. Thomas Rd., Phoenix, Arizona. yeah, great bit of history, thanks for sharing! Wow! As a white belt this is inspiring! My wifey is interested in starting Jiu Jitsu. I will pass this on to her!